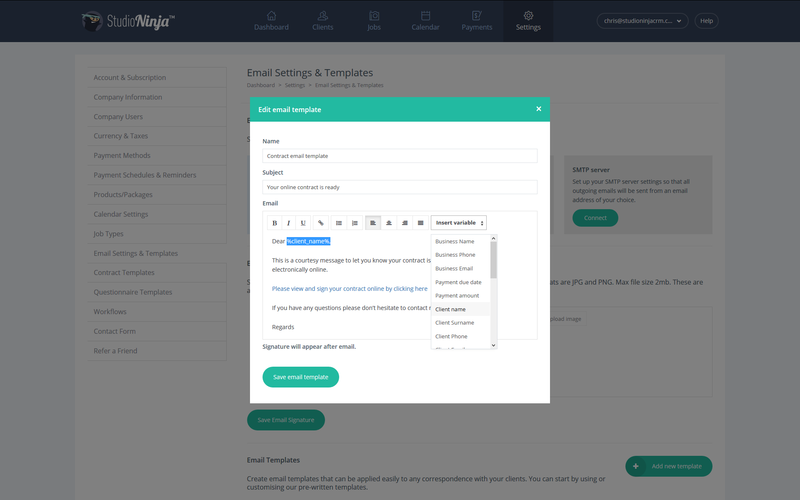 If you'd like to make personalized email and contract templates, it's best to use variables. Variables help you pull important information from your client, lead or job so you don't need to put these in manually, saving yourself time and help you avoid mistakes (imagine sending an email addressed to the wrong client!). These are variables relating to your company - your company name, phone number, and email address. If you're sending notifications on payment dues and due dates, you can use these variables, but please note that they can't be used as part of a workflow email. Read more about Payment Reminders. Will take your client's first name so you don't need to keep typing names manually on your emails, and will also send the date and time of the job. Note: This only pulls the primary client information (if you have a job with secondary clients). This pulls information regarding the job itself - job dates, deadlines, locations - especially useful for contracts and reminders.